My second guest post is from the person who introduced me to the delights of food and cooking from a very early age – my mum! Rosemary Hamilton is an accomplished cook – having trained as a home economist and worked for Good Housekeeping in the swinging sixties. If any of you have one of the cool retro GH cookbooks from that era – my mum helped write those and you can see her hands in the photos! I love that! Mum was a bit taken aback when I asked her to write a guest post, but she hasn’t let me down. The following recipe is a classic handed down by my beloved Gran, typically served for pudding after a sunday roast… enjoy! When Katie asked me to be a guest blogger – my first thought was HELP! I was about to drive from Shropshire to a family funeral in Derbyshire and thought I might get some inspiration on the way. 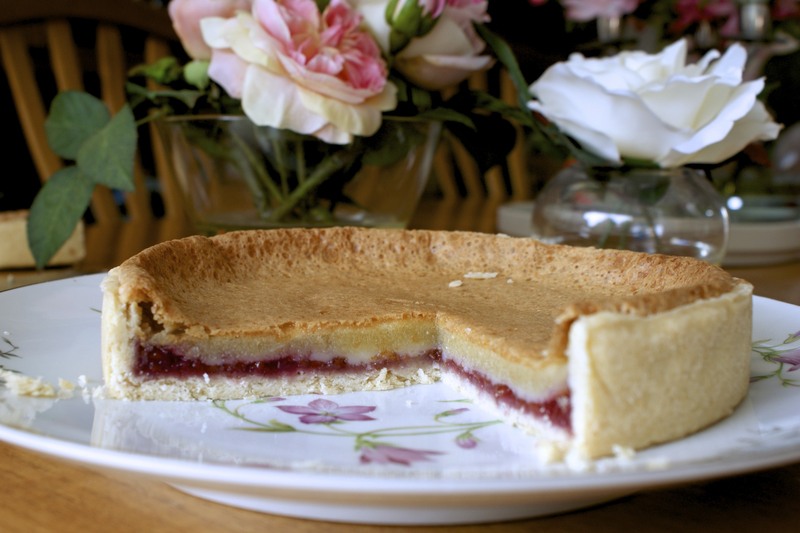 Too true I did, going through Bakewell I had a Eureka moment – my mum’s Bakewell Tart! This has been a favourite in our family and I continue making it. The ‘real’ Bakewell Pudding uses a base of puff pastry and a filling with a secret ingredient. Mum’s has a shortcrust pastry base and a filling as near as you can get to the real thing. It is not an almond flavoured sponge like the commercial ones. 1. Heat the oven to 200’C, 180’C Fan, Gas 5-6. Spread the base of the uncooked pastry case with the jam. 2. Beat the egg and sugar until light and fluffy, then add the melted butter and mix well. Stir in the ground almonds and almond essence. Pour into the case. Bake in the oven for about 25 mins until the filling is firm. The mixture will rise up and then fall when cool, this is normal. I always make several tarts and some individual ones. As followers of this blog know I am an avid freezer user and this recipe does freeze well. « The Daddy takeover: Holy Frijoles! Despite being a huge fan of Bakewell Tart I haven’t actually ever got round to making one myself. This looks scrummy!